Our guide will pick you up from your hotel in Xian. We will call you the night before to reconfirm your pick-up time. We will take the highway directly to the Terracotta Warriors Museum. It takes about one hour to get there. Unlike some other tours, we do not stop for shopping to waste your valuable time. Our experienced guide will show you the three excavated pits, the Bronze Chariots and Horses Exhibition Hall. You will have at least two and a half hours to explore this significant site. Lunch is not included since there are no decent restaurants around the museum. While some fast food chains offer adequate and hygienic lunch at US$3-5 per person, which is even much better than the tourist food arranged by some other coach tours. Our guide will assist you in selecting a place for lunch. 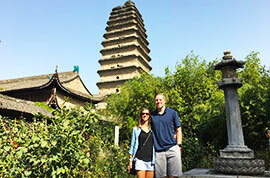 The tour continues with a visit to the Small Wild Goose Pagoda built during the Tang Dynasty (618-907). Here you can learn more about the history and culture of Xian. Our guide will show you the ancient City Wall built over 600 years ago. You can walk on the City Wall or rent a bike to ride on it. The bike rental fee is at your expense. Our last stop will be the Muslim Bazaar, the most thriving area of the city. If you are interested, you can explore the bazaar at your own pace and then return to the hotel on your own. Our guide will give you directions for returning to your hotel. The Great Mosque and the Bell and Drum Tower Square are within walking distance of the Bazaar. The Bazaar offers a number of excellent choices for dinner. If you prefer not to go to the Muslim Bazaar, we will take you back to the hotel after we drop the others off at the Bazaar. No tourist shops or factories to take up your valuable time for sightseeing. We keep the group size small (1-6 persons) so that every member will be well cared for. We will help you avoid the ticket line at the entrance of Terracotta Warriors Museum. Our expert guides & drivers are superb at taking care of all the trip details. You enjoy Free cancellation up to 24 hours prior to the trip. Confirmation: Upon receiving your booking request, confirmation will be sent within 24 hours. Payment: Full payment is required at least two days prior to the trip. We accept payment by PayPal, Credit Card, Alipay, Wechat and Bank Transfer. Cancellation: Your payment is fully refundable if you cancel more than 24 hours prior to the trip. Cancellation within 24 hours or any unused portion after the day trip begins is non-refundable. Pick-up Service: Xian is relatively a big city. To ensure the morning pick-up service goes smoothly as scheduled, we recommend that you stay in the downtown area. If your hotel is located in a narrow lane or an apartment block, we suggest you find a nearby hotel on a main street to serve as your pick-up point. Schedule: The time schedule of the itinerary is for reference. It may be adjusted according to the traffic and real situations. What time will you pick me up at my hotel? How will you contact me? The normal pick-up time is between 08:00 and 09:00. Your guide will contact you the day before to confirm the time with you. It is easier if you have Wechat, or a valid cell phone number. If you do not have any of these, the guide will call your hotel between 19:00 and 20:00 to speak with you or leave a message for you at the front desk. You can also dial our 24-hour mobile number 0086-18629541315 to speak with us. We are always here to help. Will it be an all English speaking tour? Yes. 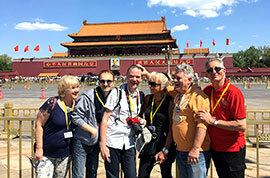 We will arrange a professional English-speaking guide for your mini group. Will I receive confirmation after I make my payment? Sure, we will provide you with a travel voucher including all travel details. What do you need from us once we book the tour? We need the names and passport numbers of all travelers in your party, the full name of the hotel you will be staying at in Xian, and the best way to contact you. We have a flight out after the day trip and will need to be at the airport. Can we be dropped off at the airport instead of the hotel? Our price is quoted based on dropping you off at a downtown hotel. If you need airport drop-off service, a separate driver with a private car needs to be arranged. In this case, there will be an extra transfer fee. Your travel consultant will be happy to help you with this upon request. I will be travelling with my daughter, and would like to know what the cost will be for one adult and one child. For an infant under 2 years old, there is no additional charge. For a child between 3 and 11 years old, the price is USD 10 less than the adult fare. We do not want to hire a bicycle to ride on the City Wall. Can we just remain at the wall while the rest of the group rides their bicycles? Sure. You can choose to either ride a bicycle or take a leisurely walk on the wall. It is flexible. 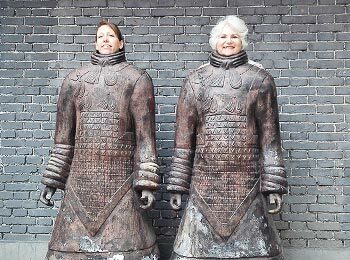 The tour was short but perfect covering the sites of old town Xi'an and the Terracotta Warriors. Our guide spoke good English and had good knowledge regarding the sites. But do shop around - there are other cheaper options. Everything went well in both places. We used them for Beijing and for Xian. as well as to purchase train tickets. Guides were very well informed and spoke excellent english. They went out of their way to make sure hotel and show arrangements were all looked after. 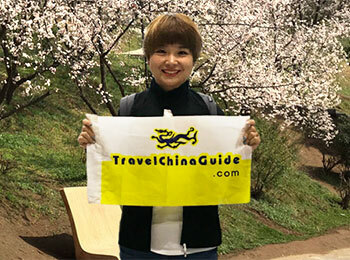 One day tour to Xi'an from Chengdu? 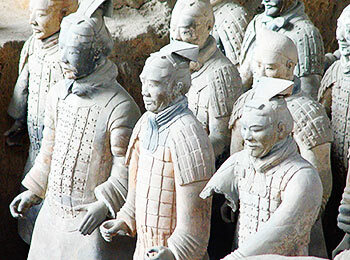 Do you have one day tour to Xi'an Terracotta Army from Chengdu by bullet train? 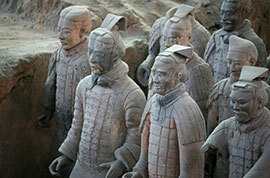 We have 5 or 7 people are interested visit the Terracotta Army but your tour is starting in Xi'an. We need to return to Chengdu in the same day. You need to take the earliest high speed train from Chengdu to Xi'an and return to Chengdu in the evening if you would like to join a one day terracotta army tour from Chengdu. The earliest train departs at 7:00 am from Chengdu East Station and arrive in Xi'an at around 10 am. And if you want to return to Chengdu at the same day, the last high speed train runs at 19:50 from Xi'an North Railway Station to Chengdu East Railway Station at 23:00. As long as you don't mind getting up early to catch the early train and returning late, we can arrange one private one day Xi'an tour from Chengdu for you. Please feel free to contact us if you have any further question. Thanks! my dad will be enjoying the trip if tour guide can speak Cantonese. My flight will arrive at Xi'an around 22.50 and how can I get a shuttle bus to Zhonglou station? Don’t worry! You can take shuttle bus –Nanshaomen Line to Xi'an Hotel and then catch a taxi to the Zhonglou. 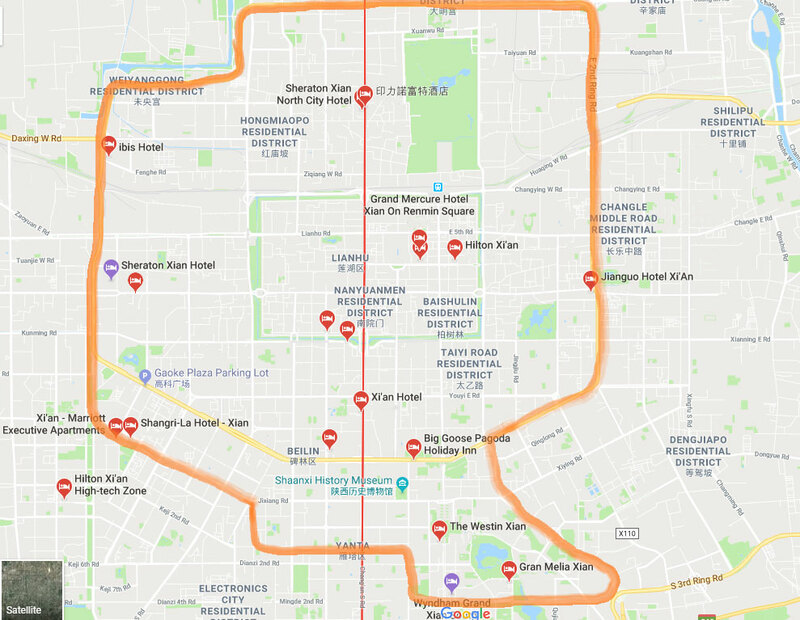 Or can I take a shuttle bus - Xi'an North Railway line and take subway to Zhonglou? I'm not sure if the subway will be closed then. I saw in the website that the last train of the North Railway line is 23.15. Thanks. I am afraid not. The last bus to the North Station leaves airport at 21:00. I'd recommend you take shuttle bus Xishaomen Line which runs till the arrival of the last light, or Railway Station Line which operates till 02:30 the next day. After getting off at the terminal station of either line, you can take a taxi to Zhonglou within 10min with the fare of no more than CNY15. How to I get to jinjang inn bell tower branch from xian airport. From the airport to jinjang inn bell tower branch , which airport shuttle bus should I take to ? What is the metro line station near jinjang inn ? What are the place of interest near jinjang inn within walking distance? 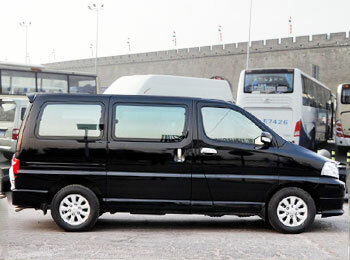 You should take shuttle bus nanshaomen line to Xi’an Hotel and then take a taxi to your hotel. Zhonglou (Bell Tower) station of line 2 is near the hotel, and you can go to the tower, city wall, and Forest of Stone Steles Museum on foot.